You will be given a reference e-book to read which has 265 pages And the test will be based on that e-book , you can take final test within 1 year of purchase. Wilderness survival refers to the process of keeping yourself alive in the wilderness. It involves improving your skills in dealing with all the elements and risks linked to living in the wilderness so you will be able to survive this adventure. Millions of people are adventurous and they would do everything to experience life in the wilderness in a more primitive fashion. This means that living without any guns, log cabins, axes and any other useful manufactured items and products. If you are one of the millions of people who enjoy lots of outdoor activities including fishing, hunting, horseback riding, backpacking and hiking, then maybe it is time for you to improve your survival skills in the wilderness so you will be able to efficiently handle even the most difficult emergency situation. In your attempt to survive the wilderness, gathering essential navigation tools is a must. These include a compass, GPS and a map. Without these navigation tools, you will be at risk of flirting with disaster. It should also be noted that a lot of those who are experts in venturing into the wilderness always state that it is extremely important for you to know the basics of building your own shelter using the materials that you can find there and learn everything about signaling for help. It is also important for you to improve your skills in hunting for food, building and maintaining a fire and finding and preparing safe and consumable water. 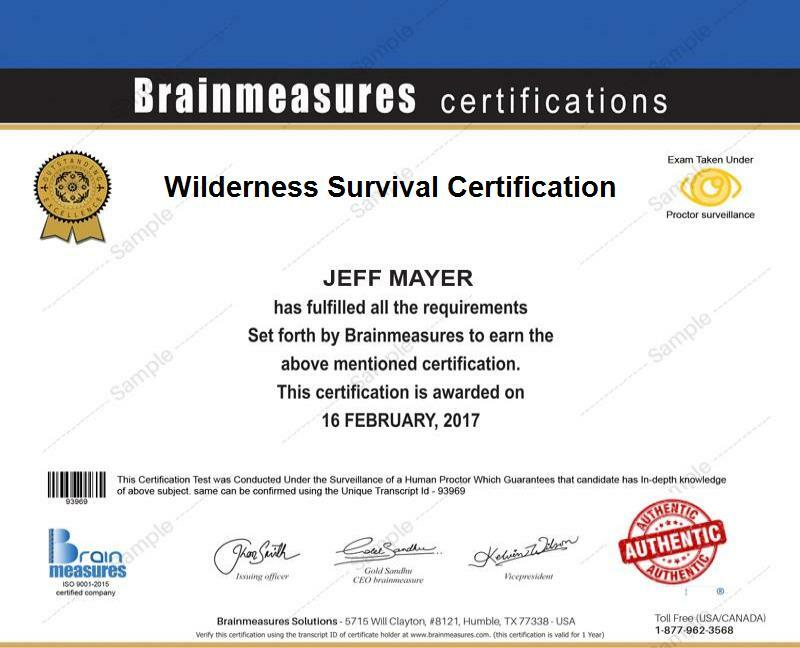 If you have an adventurous spirit which makes you strongly desire of becoming an expert in surviving the wilderness, then the online certification program called wilderness survival certification program offered by Brainmeasures at present is very suitable for you. This wilderness survival course is extremely beneficial for you because it strongly aims to help you gather information about all the risks involved in living in the wilderness and how you can effectively survive them. Your decision to take part in this online certification program gives you the opportunity to undergo a wilderness survival training which covers everything related to the topic including the secrets to surviving in the wilderness, basics of building fire and any other things that are extremely useful for your survival, wilderness risks, how to determine if you are already facing extreme danger and how you can effectively deal with all the risks and dangers that are being laid out to you. Your wilderness survival certificate can help you out in your attempt to prove to the whole industry that you have the strongest background in the field. How to deal with the risk of getting lost? If you really have a strong desire to strengthen your wilderness survival knowledge and skills, then the wilderness survival certification program is extremely beneficial for you. This program targets a wide range of individuals and professionals in this industry including those who are in charge of manufacturing the most reliable and effective wilderness survival kits and those who are responsible in training different individuals about the basics of surviving in the wilderness. Your earnings as soon as you hold your wilderness survival certification may also increase. As a holder of a wilderness survival certification, working as a wilderness survival risk analyst will become easier and this will usually let you earn around $48,000 to $67,000 annually. Working as a wilderness survival instructor is also a great possibility and this profession allows you to enjoy approximately $47,000 to $89,000 yearly.